Fall classes are enrolling now. Classes start the week of September 11th. Egg in Nest is a unique Art Studio offering Art Classes for children and adults in the Southwest Raleigh, Cary and Apex area. Children of all ages gather in small groups to make art and enhance creativity. Each student works independently on art projects of their choice! 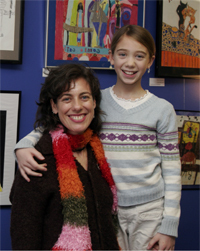 We offer after-school, home-school and track-out art class times and evening hours for teens and adults. Painting, drawing and portfolio prep classes are held weekly during the school year and Art Camps are available in the summer. Painting lessons include watercolor, oils and acrylic drawing lessons explores graphite, charcoal, pastel and mixed media materials. At Egg in Nest, in business for fifteen years, the artists receive one-on-one instruction while working on the projects they want to do. And that’s an important distinction. There are no “canned” art lessons here. Instead the projects are chosen by the artists and reflect each student’s interests and personality (age 5-adult). The studio caters to students of all types from home schooled young artists to year-round students, or those attending traditional semester schools. The approach is designed to nurture creativity from the start of class to the end, which comes way too suddenly for the students who hate to leave this highly creative, working-studio environment. “In the beginning, new students wait for instruction from me on what to do. And that’s the impact our ‘top down’ learning system has had on our children, teaching them to wait for lessons to be doled out. At our studio, the young artists lose this behavior in a week or so and are soon picking out their own supplies and starting on their projects just like the experienced students do. It’s so much fun to see the creativity take charge.” says Jenny Eggleston, the resident artist, and the “Egg” in the studio’s name. With each student working on their own projects there is a wide range of media out at any given time. Each student, therefore, gets exposed to a wide variety of techniques and materials. As the students work on a their individual projects side by side mentoring develops, suggestions are made along with gentle critiques and open praising. The elements of design, basic and advanced drawing techniques, and color theory are most often topics of discussion, mixed with stories of art masters. And at every step, love of art is the underlying theme. Jenny comments that with this open and unique organic approach, the artists are happy and more creative.